Its been a while since Yesbank ran the spend based offers and we were all waiting for it to happen.. and here they are! Yesbank has a new spend based promo with which you get Bookmshow Winpin Vocuher worth upto Rs.500 based on your spends. Note: Its a targeted offer. Check your email if you’re received any communication. As you can see, its a nice 10% value on spend, which is a great number in the industry. 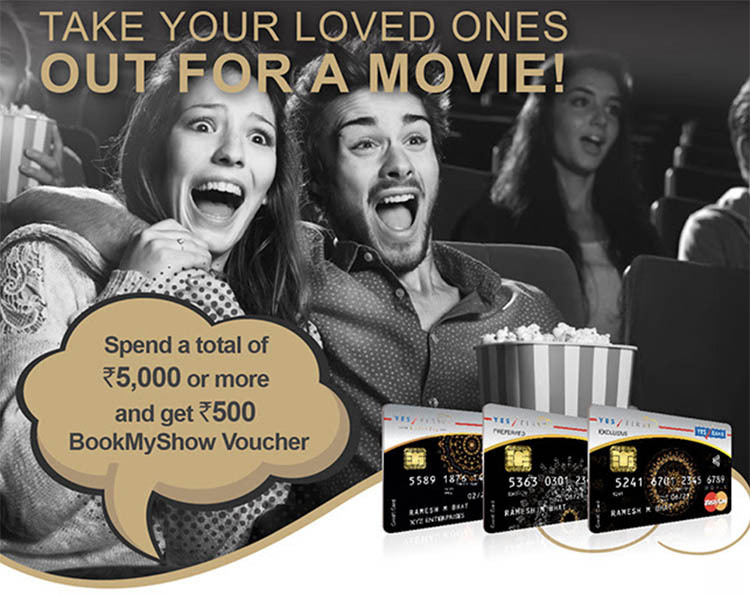 If you’re a movie buff, this is a wonderful offer from Yesbank as BMS winpin vouchers are easy to redeem & also it is easy to hit the given thresholds. Do you like this BMS offer on spends? Do share your thoughts in comments below. 1) What is eligibility for Yes First Savings A/c? 2) I have classic savings a/c holder for HDFC. What makes me eligible to Preferred? How much time will it take? Any specific amount or transactions? I have manually upgraded from Classic to Preferred. Just tried redeeming yes reward points. Amazon & Flipkart not found. Hope this is temporary… and Amazon will be back in stock soon !!! Yes, they removed it about 2 weeks back. Lets hope they add it back. i have 10000 reward points want to redeem against amazon voucher but not in stock. I have received the offer on yes prosperity but not on yes first…. Yea, seems to be targeted. Maybe i got it as i didn’t use it for couple of months. This is not for all the card holders, I didn’t get any communication regarding this offer and they mentioned in T & C also , only selected card holders. Seems to be. Just updated the article. Is this a targeted offer or applicable for all card holders of the said variant? I haven’t received any mailer or can’t see it on bank site. Get 10% cash back as statement credit up to Rs. 1,000 on spending at any of our partner merchants during the offer period. Our partner merchants for this offer are Amazon, Flipkart, Myntra, Jabong, Grofers, BookMyShow, Uber, Ola and Swiggy. The offer is valid till 15th June, 2018. Terms and Conditions apply. I can even see my cash back, once transaction is reflecting on my statement. Will it effect my application. I’m not totally maintaining yes bank accounts. you can email me your contact number will get it for you. will they check my account history. they will approve or not. Have you used this offer? Dear Valued Customer, last week to get Rs.500 cashback on spending a total of Rs.10,000 or more with your YES FIRST Debit Card ending ××××. Validity: 1- 30 Jun’18. Not received any offers from yes bank credit card? Should show up by next qtr, or maybe earlier if we’re lucky. Does the BMS winpin coupon comes in email? I am having a hard time getting my email updated with Yesbank?